Plugin for navigation on maxscript project. Display the list of functions and structures from maxscript file(s). Go to definition from working area or tree. Ability to insert function with parameters into working area. Display tooltips with related comments and parameters for selected function. Should it be added to the pluginManager? Seems it is just available for the N++ 32bit version, is this correct? https://github.com/kbilsted/NotepadPlusPlusPluginPack.Net/releases supports x64 since 0.93.87. @chcg - Is it possible? PS - sorry - I was miss emails about replies. Yes - now it’s available only for N++ 32bit. New plugin for navigation on maxscript project. 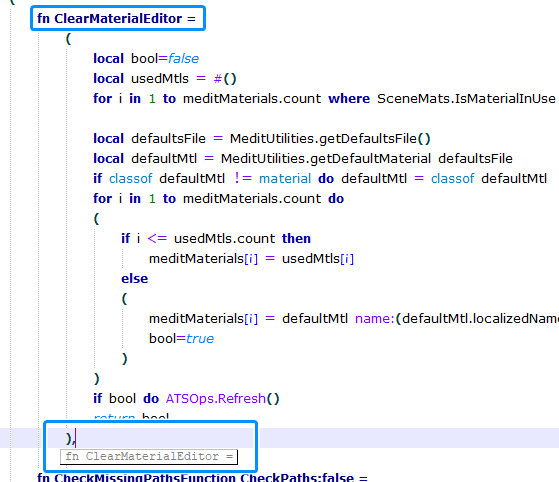 Adds an ability to copy the full path of function or struct from menu. How I’ll update the plugin in future? Do I have to do something else now? And how I can log into “Notepad ++ Plugins Repository”? You could try to register at https://npppm.bruderste.in/users/register, but that could last some time as @bruderstein is not so often around right now.